While our venues are the stunners, it's our personalized wedding planning service that will truly knock you out. Your dedicated Gaslamp wedding manager will hold your hand through catering decisions, room block negotiations, and even the acquisition of your marriage license. We also offer insider connections to preferred florists, photographers, DJs and bands. With the leading outdoor wedding site, breathtaking indoor venues, and impeccable service, the question isn't whether you'll marry him - it’s why you'd marry anywhere else. From movie premieres on one of San Diego's most expansive rooftops to a chef's dinner in our wine cellar looking onto an original Piccasso, Andaz offers a variety of eloquent venues. Whether you are looking to have an intimate dinner party or you would like a 600 person reception we personalize every detail for you. An event is a highly personal expression, as unique and special as the person throwing it! At Andaz, we don't just plan an event. We make it YOUR event. 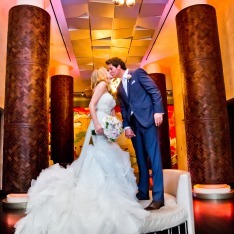 A joyful event that blends passion, creativity, elegant service and obsession with detail to create a dream come true. This is your event. Doesn't it deserve more than an everyday feel? 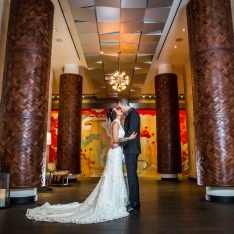 Hold your wedding at Andaz San Diego and you will receive up to five complimentary nights at a participating Hyatt resort in the United States, Mexico or Aruba. For more information please contact the hotel for details or click here. 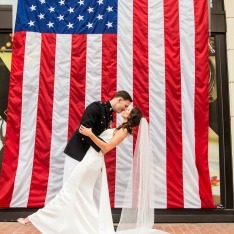 Contact our San Diego, California wedding planning team now to inquire about availability for your desired date and receive more information. Just can't get enough of us? Our lively Gaslamp Quarter setting is ideal for bachelor / bachelorette weekends, while our gorgeous suites double as passionate honeymoon love nests. You have contacted Andaz San Diego!